WELLINGTON, New Zealand - Happy Feet is now a creature of the Internet age. The wayward emperor penguin, discovered on a New Zealand beach six weeks ago, will soon be returned to the wild -- but not before he picked up an online following of more than 120,000. That's how many unique visitors have logged onto a Web camera monitoring his every move. Thousands more are expected to follow the updates after he's released in coming weeks, with feeds from a GPS tracker attached to his back posted online. And then there's the chatter on social networking sites like Facebook and Twitter. His followers don't seem bothered that Happy Feet, nicknamed after the 2006 animated movie, does little more than eat, sleep and occasionally waddle. "At 11:20 p.m. in New Zealand, Happy Feet was sound asleep with his left foot and flipper sticking out," one Facebook fan wrote. "Five minutes later, he pulled in his left foot and flipper and just got up! :)"
The penguin was found June 20 on Peka Peka Beach, about 40 miles (65 kilometres) northwest of Wellington and far from his Antarctic feeding grounds. He was moved four days later to the Wellington Zoo after becoming ill from eating sand, which he likely mistook for snow. He has since gained weight and been given a clean bill of health to return to the ocean. His unusual journey captured worldwide interest, with local TV3 station setting up a webcam on June 30 in his small, ice-filled room at the zoo. 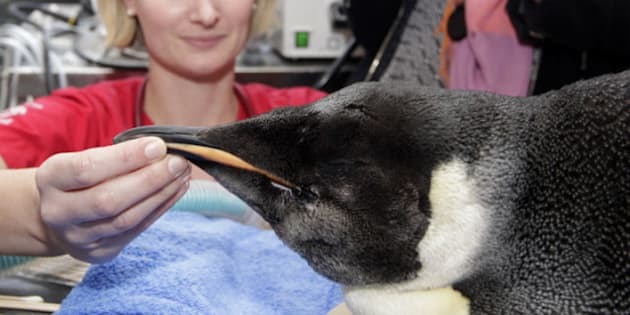 The phone calls began coming in soon after, even prompting the zoo one night to send a veterinarian to check on the penguin after the station was swamped by worried callers convinced Happy Feet had died, zoo spokeswoman Kate Baker said. It turned out the penguin was sleeping. One woman wrote an email to TV3 saying she was ill but taking "a lot of comfort in simply watching the penguin." "It's kind of like O. Henry's story 'The Leaf,'" wrote the woman, identified as Janet in Chicago. "I feel as long as the penguin does well, I'll do well." The station's Wellington bureau chief, Gordon McBride, said he and a colleague came up with the webcam idea and the zoo agreed. "It's such an unusual thing, and people like to see that," McBride said. After the "great response" to the penguin's webcam, the zoo is now considering live streaming other animals and the zoo's medical procedures, Baker said. The zoo raised the $10,000 through a public campaign to cover the costs of housing Happy Feet, Baker said. It has also raised about $8,000 so far for returning him to the sub-Antarctic ocean south of New Zealand -- a trip that could cost up to $30,000. The GPS tracker unit will likely come off when Happy Feet molts in April, if not sooner, though the penguin has also been fitted with a microchip that will be triggered if he roams near monitored colonies in Antarctica, she said.